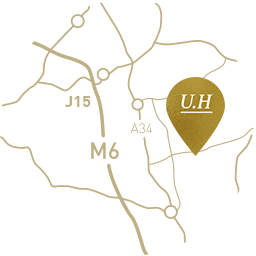 The Upper House Hotel is steeped in local history, built in 1845 for Josiah Wedgwood’s grandson, Francis the hotel has been lovingly converted into a luxury character property. The hotel has 24 individually decorated en-suite bedrooms and is set in 10 acres of woodlands and beautifully landscaped gardens. The Upper House provides a restful haven for individual guests, a stylish backdrop for weddings and receptions and an impressive, peaceful environment for company meetings or family and friendly get-togethers, large or small. Our innovative restaurant prides itself on using the finest local produce (where possible) and sits alongside our Regency bar, cosy lounge with log fire and stunning gardens to provide the perfect place to unwind, wine and dine. We are conveniently situated ten minutes from junction 15 of the M6, and within easy reach to many local attractions. No hesitation in recommending this superb country house hotel - from the warm welcome and help from the staff to the bar, breakfast and delightful rooms with uninterrupted countryside views. Warm welcome at the end of a long day. Lovely setting, friendly staff and spacious, comfortable room. The bedrooms are fantastic and the bathrooms are clean and modern. The hotel is tastefully done and the staff are excellent. Staff are very friendly, the food is gorgeous and well presented. We cannot wait to come back for an evening meal!